Different models were put forward about the physiochemical nature of plasma membrane. Charles Overton: He found that the substances which dissolved in lipids enter more rapidly than substance insoluble in lipid. Therefore, he concluded that plasma membrane was composed of lipid. Langmuir: He made artificial membranes by adding phospholipids in benzene to water. Benzene evaporated and phospholipids membranes were formed. Gorter and F. Grendel: They described that cell membrane is actually phospholipids bilayers. 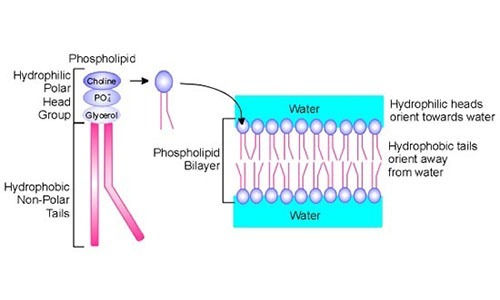 The hydrophobic ends of the phospholipids molecules are directed inward and hydrophilic ends of the membrane are directed outward. Gorter and Grendel also tried to measure the exact contents of plasma membrane but they failed. It was found that all the membranes did not look alike in the electron microscope. Plasma membrane is 7 to 8 nm in thickness but membrane of mitochondria was only 6nm in thickness. The percentage of lipids and protein was also not similar in plasma membrane and other membranous organelles. There was controversy about the placement of protein molecules. Many researchers did not accept the location of protein as described in Sandwich model. Protein molecules also have hydrophobic and hydrophilic ends. Hydrophobic end cannot be placed on hydrophilic end of lipid. Similarly, hydrophobic end of protein cannot be placed outward in water. Polar End or Head: It has phosphate group. The polar spherical heads are located over the cell surfaces (outer and inner). They are called hydrophilic (“water attracting”). Nonpolar End or Tail: It has fatty acid molecules. Nonpolar ends face each other in the middle of the bilayer. The “tails” of both layers of phospholipids molecules attract each other. So, they are repelled by water. Thus, they are called hydrophobic (water dreading). Cholesterol is also present in plasma membrane. The cholesterol molecules are embedded in the interior of the membrane. They make the membrane less permeable for water-soluble substances. Cholesterol molecules stabilize the membrane. Some intrinsic proteins are links to sugar-protein markers on the cell surface. Some intrinsic proteins move ions or molecules across the membrane. Some attach the membrane to the cell’s inner cytoskeleton or to various molecules outside the cell. Glycoproteins: The carbohydrates unite with proteins and form glycoproteins. 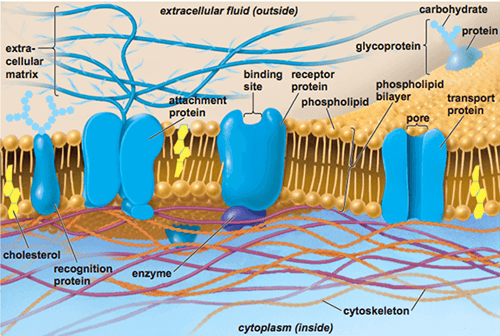 Glycolipids: The carbohydrates unite with lipids and form glycolipids on the surface of a plasma membrane. Glycocalyx: Surface carbohydrates and portions of the proteins and lipids make up the glycocalyx or “cell coat”. The glycocalyx shows complex arrangement. They have distinctively shaped groups of sugar molecules. These sugar molecules act as a molecular “fingerprint”. The glycocalyx are necessary for the recognition of cell. So, they control the behavior of certain cells. Therefore, they are key component in coordinating cell behavior in animals. It regulates material moving into and out of the cell and form one part of the cell to another. It separates the inside of the cell from the outside. It separates various organelles within the cell. 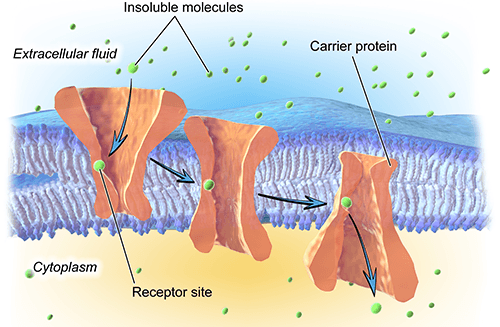 There are sites of receptors on the cell membrane. These receptors contain specific cell identification markers. These markers differentiate cell type from other cells. 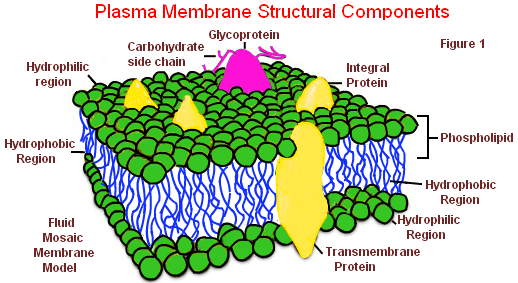 The plasma membrane allows some substances to moves in and keep others out. It is called selective permeability. It is essential for maintaining cellular homeostasis. The maintenance of a constant internal environment despite fluctuations in the external environment is called homeostasis. Molecules can cross membrane in a number of ways. They may use their own energy. Or they rely on an outside energy source. There following types of cell movements. The movement of molecules from the area of higher concentration to the area of lower concentration is called simple diffusion. The molecules move randomly. They keep on moving until they are distributed evenly. They come in a state of dynamic equilibrium. Most of the short distance takes place by simple diffusion. The movement of molecules through the protein molecules from higher to lower concentration is called facilitative diffusion. Polar molecules are not soluble in lipids. So, they diffuse through protein channels pores. The protein channels provide a continuous pathway for movement of specific molecules. Thus, these molecules never come in contact with the hydrophobic layer. Large molecules and lipid insoluble molecules require assistance for their passage through plasma membrane. Therefore, these molecules use facilitated diffusion. The facilitated diffusion also does not require energy. A molecule temporarily binds with a carrier protein in the plasma membrane. It is transported from an area of higher concentration to the area of lower concentration. 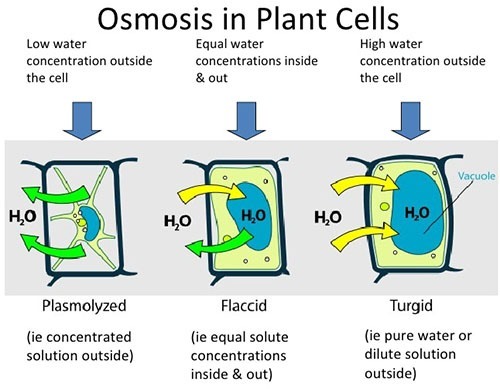 The relative concentration of solutes in the water inside and outside the cell is called tonicity (Or. Tonus, tension). There are three types of tonicity. Isotonic Solution: in this case the solute concentration is the same inside an outside the cell. For example, a red blood cell. The concentration of water molecules is also the same inside and outside the cell. Therefore, water molecules move across the plasma membrane at the same rate in both directions, thus there is no net movement of water in either direction. Hypertonic Solution: In a solution, the solute concentration is higher outside the cell than inside. Thus, concentration of water molecules inside the cell is higher than outside. So, water moves out of the cell. The cell gets shrink. This condition is called plasmolysis. Hypotonic Solution: The solute concentration is lower outside the cell than inside. Thus, the concentration of water molecules is higher outside the cell than inside. As a result, water moves into the cell. It may cause bursting of cell. 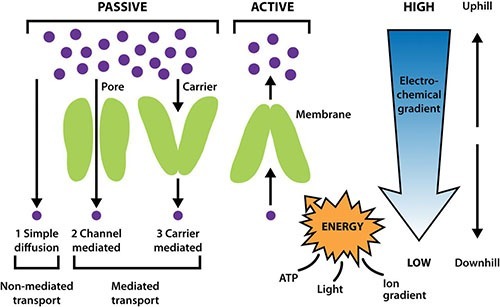 The movement of molecules from the area of lower concentration to the area of higher concentration by the expenditure of energy is called active-transport. 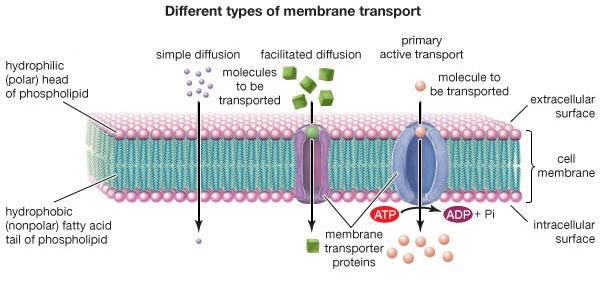 Active transport takes place against the concentration gradient. This movement against the concentration gradient requires ATP energy. Pinocytosis: The non-specific uptake of all droplets of extracellular fluid is called pinocytosis. The pinocytosis is also known as cell drinking. Any small solid dissolved in the fluid is also taken into the cell. Pinocytosis occurs when a small portion of the plasma membrane invaginates during pinocytosis. The open end of the invagination joins to form a small vesicle. This tiny vesicle detaches from the plasma membrane and moves into the cytoplasm. Phagocytosis: The uptake of solid particles by invagination is called phagocytosis. Also, known as cell eating. It also vesicles called food vacuole. Lysosome combines with the food vacuole to form a phagolysosome (digestion vacuole). Finally, the lysosomal enzyme break down the contents of vesicle. The removal of secretions from the cells by out folding is called exocytosis. The Golgi apparatus packs proteins and other molecules into vesicles for secretion. 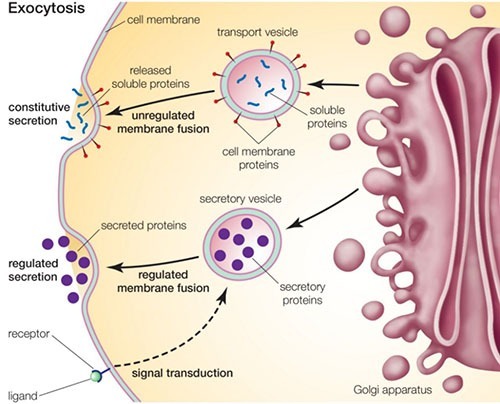 These secretory vesicles fuse with membrane and release their contents into the outer environment. This process adds new membrane material. 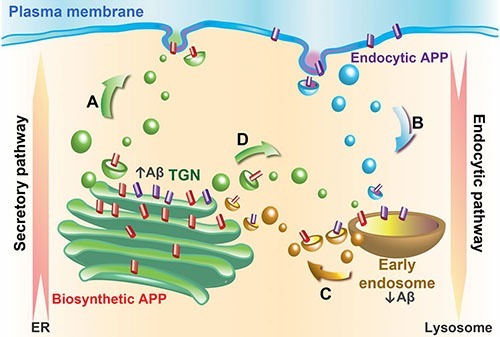 This material replaces the plasma membrane lost during endocytosis.